Bootlegger Black Friday sale: DOOR CRASHER: 50% off outerwear. 40% off everything in the store Nov 26 & 27. 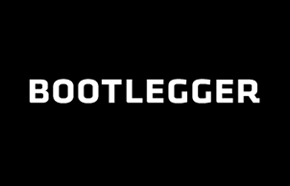 Bootlegger Canada Black Friday 2014 Sales and Deals! Here comes the biggest sale of the year for Bootlegger Canada! Enjoy these Hot Canadian Black Friday Sales and Deals while they are hot. During this Bootlegger Canadian Black Friday 2014 sale you can stock up on branded jeans and more! These are the perfect Christmas gifts and you can save during the entire weekend from November 28th - November 30th, 2014. Don't forget to sign up for their email list or pay close attention here for the Bootlegger Door Crasher Deals that will come with these amazing Canadian Black Friday 2014 Sales and Deals! Click here to check out this Bootlegger Canada Black Friday 2014 Sale! Bootlegger Canada has some excellent warm up offers to get you prepared for the smokin hot deals that are about to come with Canadian Black Friday on November 28th, 2014. Right now you can shop at Bootlegger Canada Online during their Pre Black Friday Promotion and save big on even their new collections! Right now all tops are buy one get one 50% off (yes even the Temperance collection). 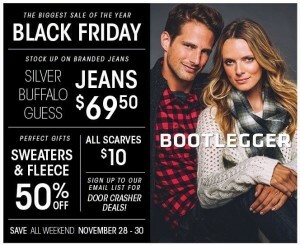 Click here to shop at Bootlegger Canada during these hot Canadian Black Friday 2014 sales and deals!